Recent news from the International Energy Agency (IEA) has shown that the rise in global CO2 emissions from the energy system stalled in 2014. This was unusual on two counts – first that it happened at all and second that it happened in a year not linked with recession or low economic growth as in 1992 and 2009. In fact the global economy expanded by about 3%. 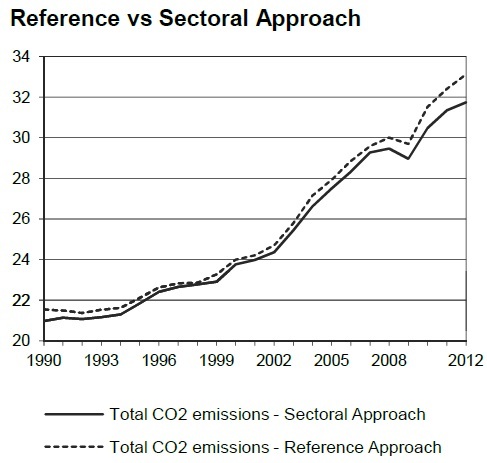 Information is scant at this point, but the IEA have apparently determined this using their Sectoral Approach (below, through to 2014), which has been flattening for a few years relative to their Reference Approach (following chart, ends at 2012). The Reference Approach and the Sectoral Approach often have different results because the Reference Approach is top-down using a country’s energy supply data and has no detailed information on how the individual fuels are used in each sector. One could argue that the Reference Approach is more representative of what the atmosphere sees, in that apart from sequestered carbon dioxide and products such as bitumen, the whole fossil energy supply eventually ends up as atmospheric carbon dioxide. The Reference Approach therefore indicates an upper bound to the Sectoral Approach, because some of the carbon in the fuel is not combusted but will be emitted as fugitive emissions (as leakage or evaporation in the production and/or transformation stage). No information has been provided by the IEA at this point as to the Reference Approach data for 2013 and 2014. Putting to one side this technical difference, the flattening trend does represent a possible shift in global emissions development and it has certainly got many observers excited that this may well be so. If this is the case, what is driving this change and what might the outlook be? It is clear that many governments are now intervening in domestic energy system development. There are incentives and mandates for renewable energy, enhanced efficiency programmes and some level of carbon pricing in perhaps a quarter of the global energy system, albeit at a fairly low level. More recently in China there has been a strong government reaction to air quality issues, which has given rise to some reduction in coal demand, particularly around major cities. But there is another factor as well and that is price – it is perhaps the overwhelming factor in determining fossil fuel usage and therefore setting the level of emissions. Price drives conservation, efficiency, the use of alternatives and therefore demand. Many of the aforementioned energy policy initiatives have been implemented during the recent decade or so of sharply rising energy prices. 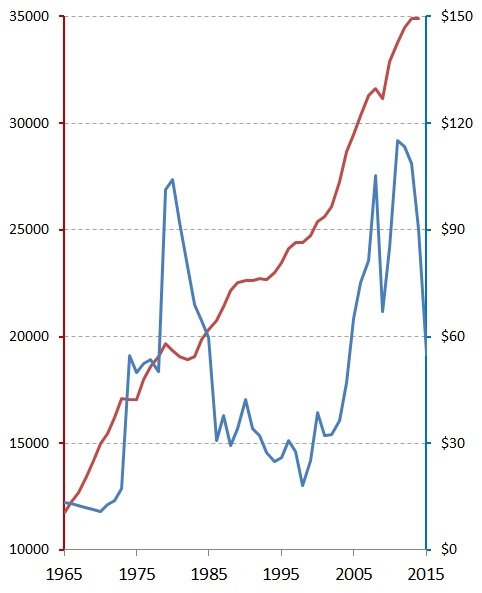 A chart of the oil price (2013 $, as a proxy for energy prices) and global CO2 emissions going back to 1965 illustrates that big price fluctuations do seem to have an impact on emissions. Although emissions have risen throughout the period, sharp energy price excursions have led to emissions dips and plateaus as energy demand is impacted and similarly, price falls have led to resurgence in emissions. This isn’t universally true – certainly from 2004 to 2008 the very strong demand from China in particular was seemingly unaffected by the rising cost of energy, although the end of that period saw a global recession and a very visible dip in demand. The latter part of 2014 brought with it a sharp reduction in energy prices (2015 is illustrative in the chart at $55 per barrel). With a much lower fossil energy price, demand may rise and the incentive for efficiency and the deployment of alternatives could well be impacted, although there may be some lag before this becomes apparent. The combination of these factors could therefore see emissions take yet another jump, but it is too early to see this in the data. 2015 emissions data might show the first signs of this. There is of course continued upward pressure on emissions as well, such as the growth in coal use that is now underway in India. Over the three year period to the end of 2014, coal capacity increased from 112 GW to nearly 160 GW. This is the equivalent of some 300 million tonnes of CO2 per annum. 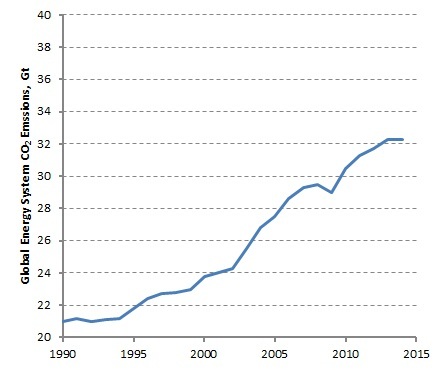 By contrast, a five year period from 2002 to 2007 saw only 10 GW of new coal capacity installed in that country. Although India is installing considerable solar capacity, coal fired generation is likely to continue to grow rapidly. One area of emissions growth that is not being immediately challenged by a zero emissions alternative is transport. The automobile, bus, truck and aviation fleets are all expanding rapidly in that country. The other big uncertainty is China, where local air quality concerns are catalysing some restructuring in their energy system. Certain factories and power plants that are contributing most to the local problems around cities such as Beijing and Shanghai are being shut, but there is still huge development underway across vast swathes of the country. Some of this is a replacement for the capacity being closed around the cities, with electricity being transported through ultra high voltage grids that now run across the country. Gas is becoming a preferred fuel in metropolitan areas, but some of that gas is being synthetically produced from coal in other regions – a very CO2 intensive process. The scale of this is limited at the moment, but if all the current plans are actually developed this could become a large industry and therefore a further signifacnt source of emissions. As observers look towards Paris and the expectation of a global deal on climate, the current pause in emissions growth, while comforting, may be a false signal in the morass of energy system data being published. Ongoing diligence will be required.